The ImgBurn log file can be found in various locations depending on if you used ImgBurn directly or had it called up from another program, such as DVD Flick or DVDFab. The ImgBurn log file is an extremely useful part of the program. It not only provides you with the details of every individual session. It helps you troubleshoot if any errors happen. It's wise to have the log window open all the time, as a lot of vital information is written in it on every step of the way for the various tasks that you can perform with ImgBurn. This makes you much better informed about potential warnings and errors than most other burning applications. By default the log window is always open as default when you install the program, but if you have shut it down and can't see the log window, simple open the log window by using the shortcut key Ctrl + Shift + L. You can also use the menu system to reopen the log window. 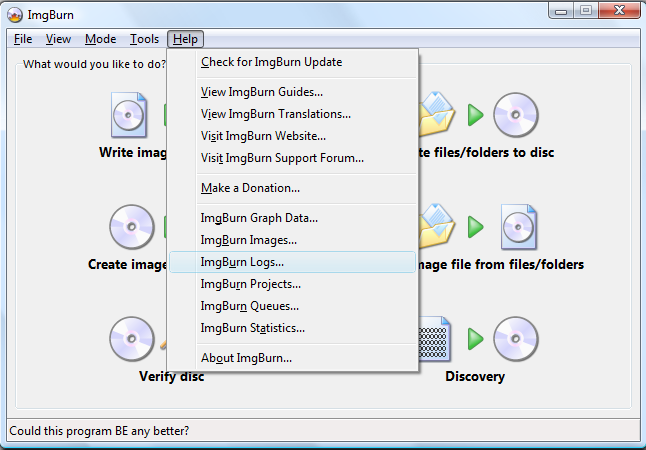 The ImgBurn log is saved on your hard disk, as long as you have the option 'Save the Log' enabled in the settings. This option is enabled by default when you install the program. Use the menu system to go to the location where ImgBurn saves the log file. First select 'Help' and then 'ImgBurn Logs...'. You should then see the location of the log file. Double click on the file 'ImgBurn.log' to open up the log in the associated text reader, such as Notepad. If you used DVD Flick and had ImgBurn selected as the burning engine, the log is saved in the same location as your project destination folder. You should see the location in the lower left corner of the main screen of DVD Flick. In this example it's named 'C:\Users\Cynthia\Documents\dvd'. 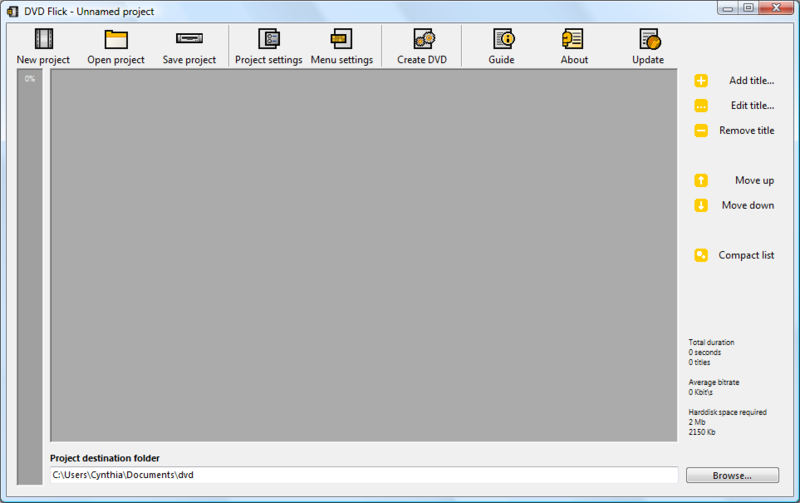 Open up a Windows Explorer window and browse to the project destination folder. The ImgBurn log is the file named 'imgburn_write.txt'. Double click on that file to open up the log in the associated text reader, such as Notepad. If you used DVDFab and had ImgBurn selected as the burning engine, the log is saved in the same location as your project destination folder. Open up the 'Common Settings' in DVDFab to see the location of the 'Temporary directory'. In this example it's named 'C:\Users\Cynthia\Documents\DVDFab\Temp'. Open up a Windows Explorer window and browse to the 'Temporary directory' folder. The ImgBurn log is the file named 'dvdfab_burn_imgburn.log'.